The Shaver Lake Power Center is located in the little community of Shaver Lake, about 35 miles from the San Joaquin Valley communities of Clovis, Fresno and Madera. Here you're in the Sierra National Forest, definitely the land of adventure. Arrange to rent our great Rhino vehicle. Our units are fast and tough. We know you like your sports extreme and our equipment is durable. It has to be to keep up with the playful, adventurous spirit that is at the heart of the American identity. For many adventure minded individuals, the chance to hit the trails on a Rhino is an opportunity that just can't be missed. 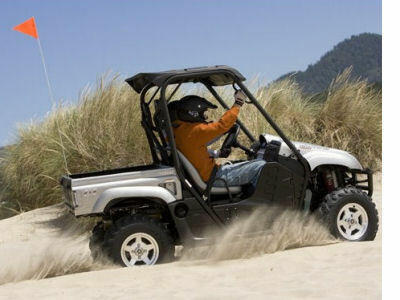 The 4 x 4, 2 Passanger Rhino with a 4 Stroke Engine has a rental rate of $250 for 24 hours, with a $1,000 credit card security deposit. All those with reservations must come to Shaver Lake Power Center at 41359 Tollhouse Road, Shaver Lake. We have a strict 24 hour cancellation - or no refund. Please download this Rental Contract Form, print it out, complete it and bring it with you to save you time in the rental process.